Here's the next four seasons of Generals programs I have. After losing the Colonial Cup, the Generals reloaded for the 1997-98 season, their fifth anniversary. Robbie Nichols' squad finished in first place in the East again, but their 46-22-0-6 mark was not good enough to take the regular season crown. Attendance dipped slightly, but was still a solid 3306, third in the league. Kevin Kerr continued his streak of 50-goal seasons, chipping in 67 goals to go with 111 points. Brian Sakic, Kerr's linemate, led the team in points with 120, on the strength of 99 assists. Ross Wilson had another excellent season, scoring 50 goals, while Jason Glover added 40. As a team, the Gens scored a league-leading 371. In net, starting goaltender Andrei Mezin received the chance of a lifetime when he was named the starting goaltender for Team Belarus at the 1998 Winter Olympics. With Mezin gone for the Winter Games and the World Championships, backup Bryan McMullen and ex-Spirit Ray LeBlanc split the netminding duties, with McMullen getting the nod for the playoffs. As a team, the Gens allowed 278 goals. For the third straight year, the Generals marched back to the Colonial Cup Finals. They demolished Binghamton in five games in Round One, then zipped past Brantford in five to set up a rematch with Quad City. The series was a thriller, going the full seven games, before the Mallards won their second straight Cup in overtime, 3-2. 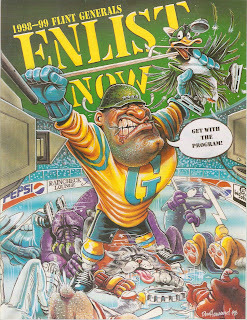 This program was from a game against the Madison Monsters, a team that, while not a world-beater, was always a tough opponent. Ray LeBlanc was in net, and despite outshooting the Monsters 41-27, the Generals lost, 4-3, in a shootout. The program commemorates the fifth anniversary of the franchise, and features the team photos of the previous four seasons. It's a lot more condensed than previous years, only 32 pages, but still loaded with ads. The summer of 1998 was an offseason of change for the Generals. During the previous season, Dr. Shukairy purchased the struggling Saginaw Lumber Kings. Robbie Nichols was elevated to VP and Chief Operating Officer of both the Generals and newly-renamed Saginaw Gears. Larry Floyd, who spent the previous three seasons in Huntsville, was picked as his replacement. 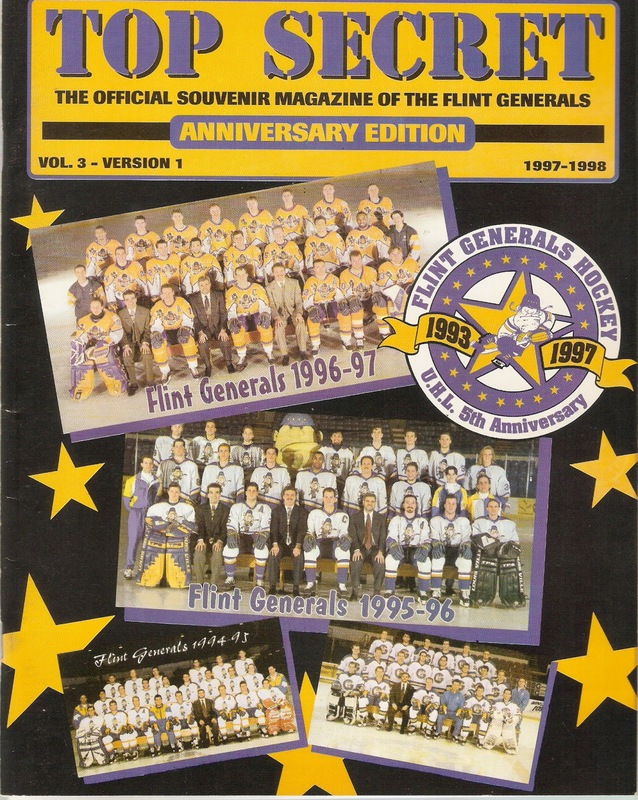 The Generals took a step back, on and off the ice, in 1998-99. Attendance dipped again, to 3037 per game, the lowest it had been since the Bulldogs' final season. Floyd's crew stumbed out to an 11-16-3 mark before he was fired and replaced by Nichols. Nichols guided the Generals back into the playoffs, but the team's 37-32-5 third place finish was the lowest since 1994-95. After five straight seasons of 50+ goals, Kevin Kerr was strangely let go, another one of the franchise's biggest blunders. He started the season in Toledo of the ECHL, but soon returned to the UHL with, of all teams, Quad City. Ross Wilson, Jason Glover and Brian Sakic tried to pick up the slack from Kerr's departure, each scoring over 35 goals and 95 points. Late-season addition David-Alexandre Beauregard scored 18 goals in 18 games as well. However, team offense dropped to 318. In net, newcomer Rob Laurie was an iron-man in the Generals goal. He played in 66 games, and despite a weaker Generals team, went a respectable 35-27-4 with a 3.82 GAA and 1 shutout. Four other netminders, led by Jean-Yves Dube, played the remainder of the games. As a team, the Gens allowed 299 goals, a slight increase from the previous year. The Generals play finished the regular season on a strong note, and faced the BC (Binghamton) Icemen in Round One. The Generals upset the first-place Icemen in five games, then faced a powerful Muskegon Fury squad in Round Two. Despite being underdogs, the Gens battled the Fury to seven games, before falling to the eventual champions. Nichols resigned after the season was over, and a long search for his replacement would take a good portion of the summer. This is easily the most artistic program cover the Generals had. All the teams in the UHL at the time are featured. Of course, the Quad City Mallard is getting special attention from General Rally. 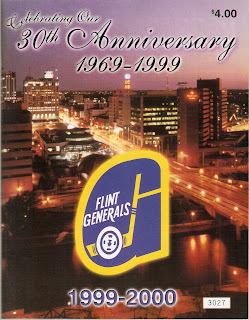 1999-2000 was the thirtieth season of professional hockey in Flint, and it was a memorable one. The team went retro for the season, bringing back the IHL Generals' logo and jerseys for the occasion. Nichols was replaced by former Red Wing Doug Shedden, who had previously coached in Louisiana of the ECHL. Shedden built possibly one of the greatest minor league teams in recent memory. From Louisiana, Shedden brought along Don Parsons (future all-time scoring champion), Nick Stadjuhar and Gary Roach. Several players on this season's team had extensive experience in the ECHL and AHL, a few even making it to the NHL. The Generals lived up to expectations, jumping out to a 10-2 start and rolling to a 51-14-9 record, tied with Quad City for first overall and 11 points better than second place Port Huron. Attendance increased slightly, reaching 3150 per game. The Generals offense was back on top of the league, with 379 goals scored. There were no 50-goal scorers, but it was a balanced attack, with nine 20+ goal scorers. The Gens were led by Parsons' 46 goals and 103 points. Ross Wilson was right behind him with 42 goals and 101 points. Captain Nick Stadjuhar contributed 22 goals and 71 points. The Generals were solid in net, led by Mark Richards. In his first season in blue and gold, Richards went 32-7-5 with a 2.91 GAA and 3 shutouts. Backup Alan Hitchen was solid in relief, going 12-5-2 with a 3.82 GAA. As a team, the Gens allowed 250 goals. After an excellent season, the Generals received a first round bye. In the second round, they eliminated a pesky Madison Kodiaks squad in 6 games, then dethroned Muskegon in 5 to return to the Finals. For the third time in four years, the Generals faced Quad City for the Colonial Cup. This time, the Generals came out on top, sweeping the Mallards in four straight to earn their second Cup. Richards allowed only 10 goals in the four-game sweep, the first Finals sweep in league history. After the season, Shedden moved on to Memphis of the CHL, and was replaced by assistant Billy Thurlow. 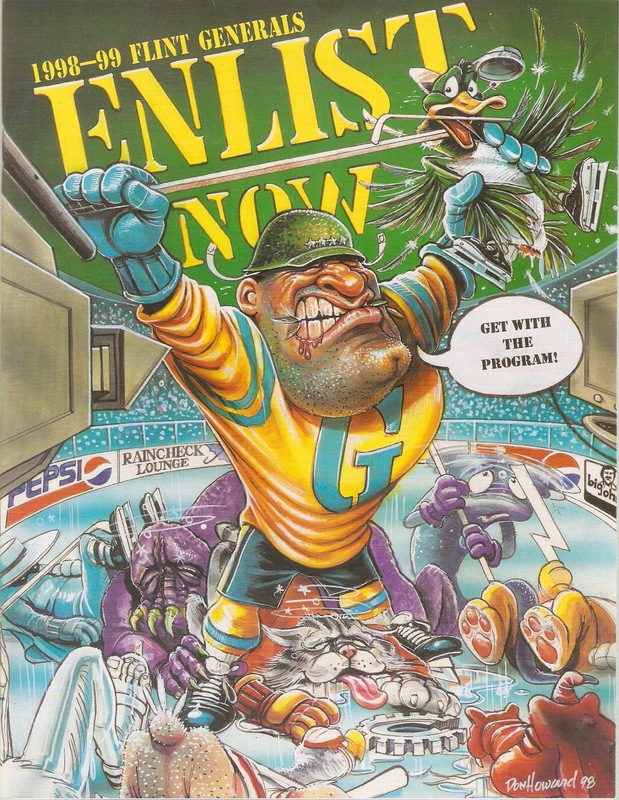 This program is from a game against the Ohio Gears, who recently moved midseason from Saginaw. Despite outshooting the Gears 52-32, Gears goalie Mike Brusseau kept it close, earning the #1 Star of the Game. The Generals won, 2-0, as Richards stopped all 31 shots he faced. This program contains a few pages from programs from each team that played in Flint, including the first season of the UHL Generals. The Generals slumped badly after the 2000 Colonial Cup, falling to 30-34-10 and missing the playoffs in 2000-01, the first time a Colonial Cup champion did so. This was also the first time the Gens failed to reach the Colonial Cup Playoffs. Changes were made after that disappointing year, as Robb King was rehired as General Manager. King hired Kirk Tomlinson as Head Coach, who had previously coached in Colorado of the WCHL. 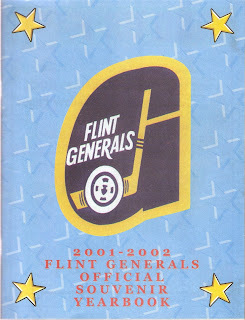 Flint rebounded from 2000-01, finishing with a solid 42-26-6 record, good enough for fourth place in the West Division, just one point behind third place Missouri. Attendance was similar to the previous year, around 2964 per game, the second straight year it was under 3000. The Generals offense was led by two players: Bobby Reynolds and Jim Duhart. Duhart, a holdover from last year, led the team in goal scoring with 52 goals, while Reynolds was tops in points with 104. Martin Woods, Scott Hollis and Dale Greenwood also scored at least 23 goals. As a team, the offense registered 294 goals. The defense greatly improved from 2000-01. The Generals used four goaltenders that season, led by Stu Dunn. Dunn played in 38 games, and went 19-13-2 with 2 shutouts and a 3.02 GAA after a midseason trade from Port Huron. Tom McKinnon played 26 games for the Generals, going a sparkling 14-4-1 in relief with a 3.46 GAA and 1 shutout. As a team, the Generals allowed 245 goals, a drop of 54 goals from the previous year. The Generals were a strong team for most of the year, but injuries began to decimate the roster. After eking past Fort Wayne for the final playoff berth, Flint faced Quad City for the final time in the playoffs. With a roster riddled with injuries, the Generals fell to the Mallards in five games (best of five series). The program for this season was much different than other seasons. First of all, it's significantly smaller, only 52 pages. Secondly, it's made out of recycled paper. That logo is a classic, btw. I went to about six Generals games that year, taking full advantage of their $6 student prices (didn't go to any 2000-01 games, too busy with my first year of college). This particular program is from a game against the Mallards, who won 5-3.